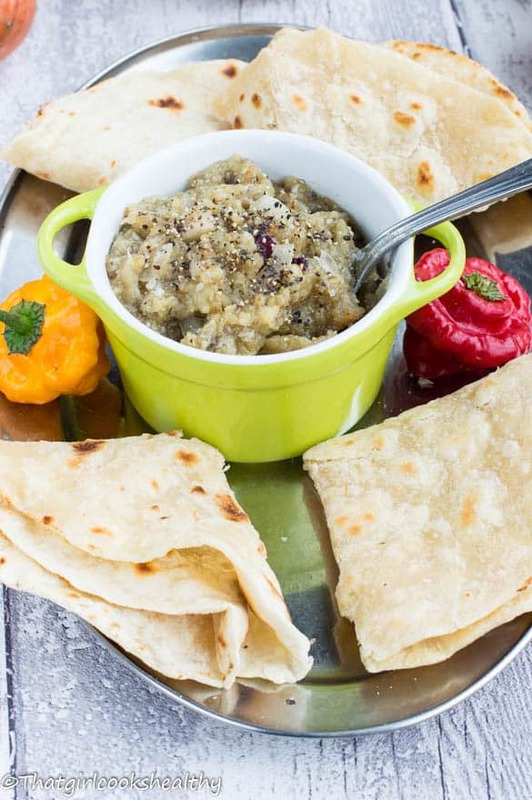 Baigan choka recipe – A vegan Trinidadian, east Indian derived side dish made from eggplant (aubergine) that’s usually roasted on a open flame then mashed. 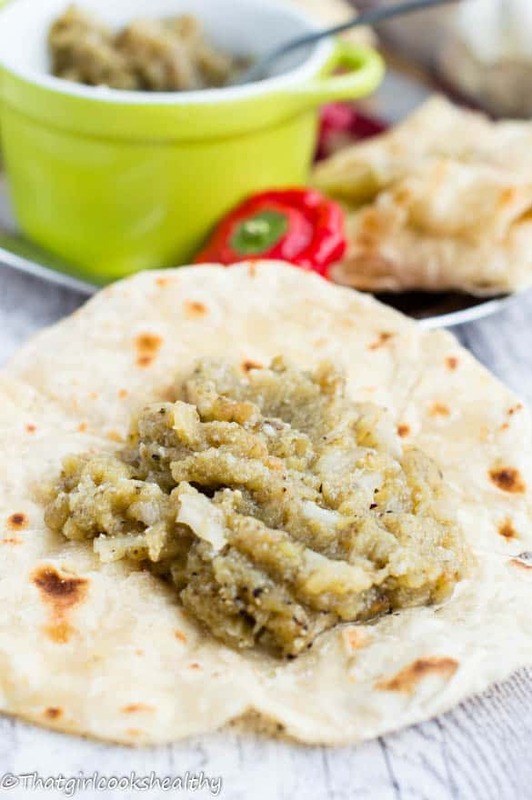 I have another amazing Caribbean recipe to share with you called Baigan choka. This one this from the wonderful shores of Trinidad and Tobago known as sweet T&T. Sweet T&T. T. This dish makes a great appetiser for a main meal or simply serve as a side dish – it’s flavoursome and easy to prepare. 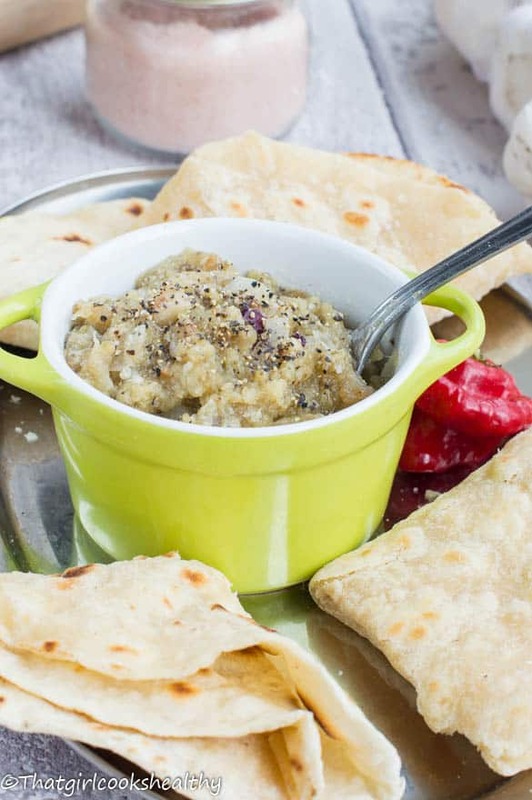 Baigan choka is essentially an east Indian derived side dish, made from roasting aubergine on a open flame, creating this wonderful smokey flavour. Now that the weather is warming up I urge you to try this on an outdoor grill, believe me the open flame imparts an incredible taste that won’t even compare to the oven. Living in the diaspora, where seasonal weather can cause adversity, makes it more difficult to roast the baigan (eggplant) outdoors. Some people prefer to roast the aubergine indoors directly on the stove, but I wouldn’t advise following this method as it can be messy. Use the oven roasted method – For now let’s settle with roasting in the oven instead, this is a lot safer with no mess or clean up. Sadly, that smokey flavour cannot be fully replicated in the oven, but the taste is truly divine. I will forewarn you, this dip is highly concentrated with garlic, so be mindful of going on any dates or socialising right after eating this. Health benefits – On a positive note, garlic is an excellent anti inflammatory property, it helps to replenish white blood cells and fight those horrid foreign substances known as antigens, so in essence the properties from the garlic trump it’s potency. Although eggplant comes from the nightshade family it contains many health properties which most can benefit from such as it’s high levels of B1 and B6 which help to assist with the cellular metabolism of carbohydrates, in other words it speeds up the metabolism and the transportation of the cells which can aid weightloss. Nasunin is a free radical fighter with the ability to counteract high levels of iron. Although we need our iron levels to be substantial, too much iron can lead to circulatory complications from years of build up. Now that I’ve explained about the health properties associated with eggplant, let’s discuss the recipe some more. This one isn’t difficult at all, most of the magic happens in the oven. In order for the garlic to impart a strong flavour, make some slits in the baigan and insert a few pieces, not all of them. How long should I roast the eggplant for? Then roast in the oven for 25 minutes, the eggplant should be soft and very limp. Do allow to cool prior to removing the skin. I usually follow Chris from Caribbeanpot’s method of part roasting a scotch bonnet for 5 minutes then remove. 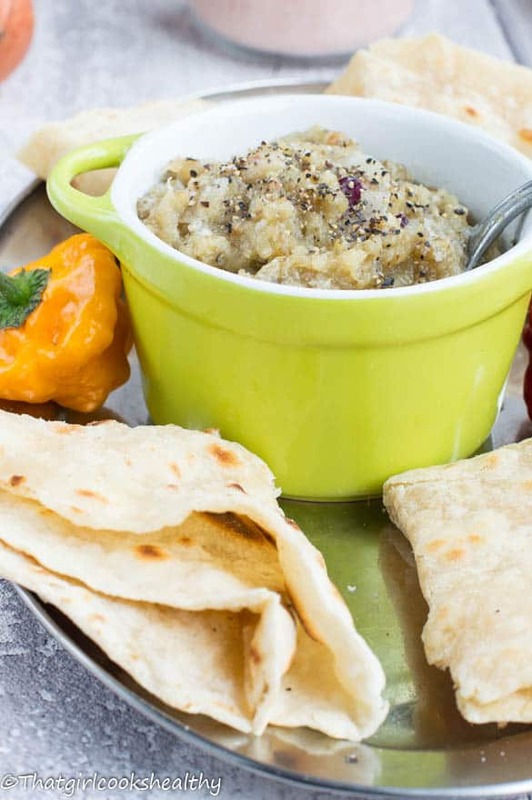 Mix all the ingredients together – In the meantime, transfer the scooped out eggplant with the onion, scotch bonnet and garlic in a bowl and mash everything together. I like to do what’s called chongkay where the oil and garlic are heated together until golden brown and poured over the baigan mix. What to eat with baigan choka? Make some slits in the eggplant and put the pieces of garlic cloves inside. Place the eggplant and scotch bonnet on a tray ready to roast. As you can see once the eggplant has roasted the skin will appear to wrinkle and limp. Make some small vertical slits about 4cm long all over the entire aubergine, be careful not to slice too deep. Insert 2 of the sliced garlic cloves into both aubergines, a total of 4 slices should have been slotted in. This will guarantee to infuse the garlic flavour into the aubergine. Rub the eggplants and scotch bonnet with 1tbsp of coconut oil before placing on a lined baking tray and transfer to the oven. Roast the scotch bonnet until darkened for the first 4-5 minutes then remove, continue to roast the eggplant until it looks limp and thin in size (should take 25 minutes). In the mean time, prepare the onions, and skin only from the scotch bonnet in a bowl. Once the eggplants have been removed from the oven, allow to cool before slicing lengthways Scoop out the flesh into the bowl with the scotch bonnet and some of the onions. Mash them all other together until smooth. Do the chongkay method by heating up the other tablespoon of oil in a miniature sized pan with the last garlic cloves until golden brown, proceed to pour the hot oil over the baigan before mixing in the salt and pepper and the remaining onions on top. I never know what to do with Aubergines…this is a very simple and easy recipe. I had this for lunch yesterday. It was quite tasty, but the onion and garlic was a bit too intense for me. Next time, I’ll use less of both ingredients. Yes. The garlic and onion can be quite potent for some. Simply scale back on both the next time you make it and enjoy!